Our 13 week picnic marathon started on Friday 13 April, we’ll be visiting a haunted location every Friday until Friday 13 July 2018. Each week we set off armed with sound recording equipment, digital cameras and an original Polaroid camera – to take an unfakeable and unique Polaroid image at each location. This week we visited Llandysul on the borders of Carmarthenshire and Ceredigion and took a stroll along the side of Afon Teifi. 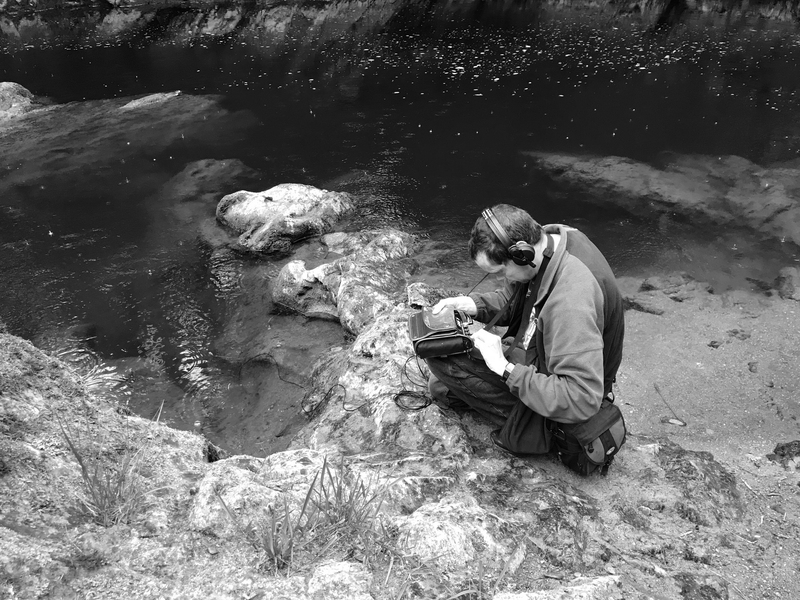 We tried a little underwater sound recording hoping to hear strains of harp music in the depths of the river. 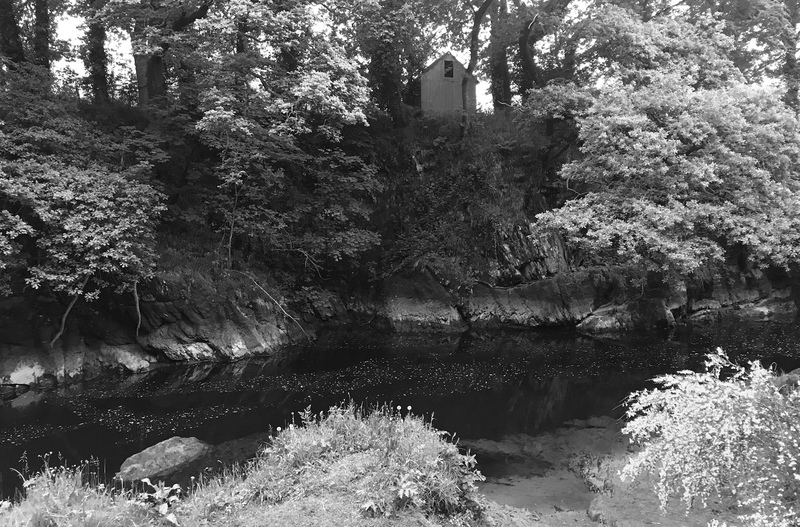 We have also read about two female spirits who haunt the banks of the Teifi. One woman, who wears green emeralds, is said to protect hidden treasure. The other is a woman dressed in black who drifts along the river bank in search of something. 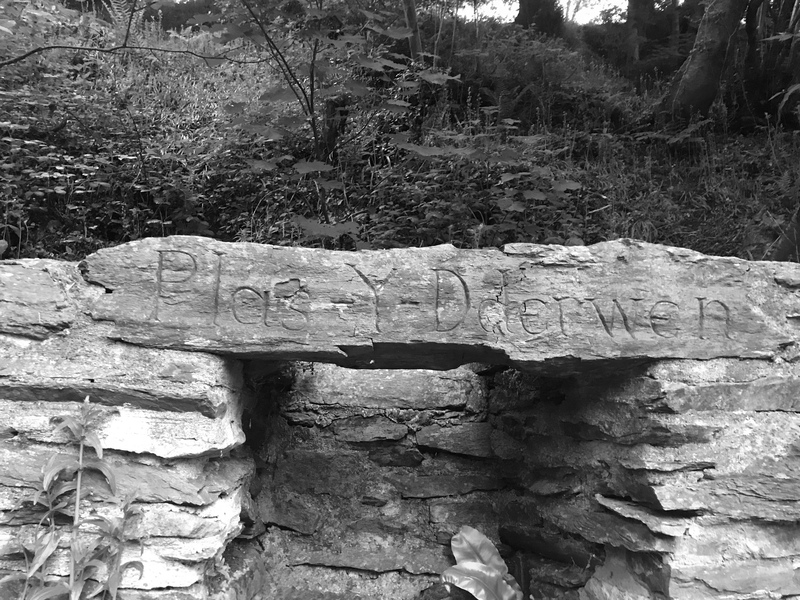 We unpacked our 13 picnic on the site of an old cottage, Plas y Dderwen, now just a ruin which has been turned into a picnic and barbecue area next to the river. A special 13 ingredient sour dough loaf from Bara Menyn bakery, 13 Devilled eggs with 13 ingredients courtesy of Kirsty…she was particularly chuffed about the ‘devilled’ bit…(Eggs, Mayonnaise, Butter, Vinegar, Mustard, Chilli flakes, fresh Chilli, Salt, Pepper, Chives, Paprika, Sesame seeds, Ras el Hannout); 13 ingredient Asparagus tart (Flour, Butter, Egg, 13 Asparagus spears, Marscapone, Parmesan, Fresh Basil, Lemon Zest, Salt, Mushrooms, Tomatoes, Olive Oil, Wild Rocket); 13 ingredient slaw with ginger (Beetroot, Red Cabbage, White Cabbage, Carrot, Apple, Celery, Red Onion, Sushi Ginger, Olive Oil, Lemon Juice, Parsley, Salt, Pepper ); organic salad leaves from Glebelands Market Garden garnished with 13 olives. We went a bit overboard with the sweet things this week…13 Black pepper, cardamom and chocolate cookies/cakes (Butter, Sugar, SR Wheat flour, SR Gluten free flour, Cocoa Powder, Egg, Cloves, Cardamom, Black Pepper, Cinnamon, Salt, Vanilla Essence, Almond Essence); 13 chocolate dipped strawberries; 13 ingredient malty cheeescake…another wonderous contribution from Kirsty…(malted milk biscuits, butter, caster sugar, full fat soft cheese, double cream, white chocolate, milk chocolate, Horlicks powder, Salt, Maize starch, Yellow colouring, Egg, finished with 13 Maltesers).